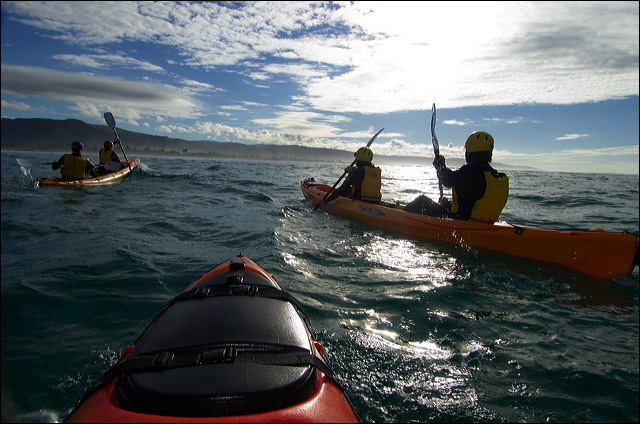 Kayaking to the Marengo Marine Sanctuary, Apollo Bay. 1 1/2 hours of instruction and touring, paddling with qualified guides, in easy to use sit-on-top-kayaks. Have fun paddling as a team in our 2 seated kayaks, and then the adventurous can catch waves back to the shore! Learn about the Australian Fur Seals and how they live. Experience them up close and personal (closer than viewing by boat) and fingers crossed they may swim over to learn about you! You must be able to swim. (This activity is not recommended for children under 12 years of age.) This is a great activity for both beginners and experienced kayakers. Meeting your guide and fellow kayakers and fitting of wetsuits. Paddles, helmets and PFDs (life jackets) are issued and sunscreen is applied! A Safety Ocean Awareness talk informing kayakers how to enter the water whilst being aware of fellow kayakers, and a briefing of the conditions of the day. A clear instruction of the kayaks and how to use them, and a demonstration of how to steer and paddle. A warm up paddle in shallow water to become aquatinted with equipment and gain confidence. Kayaking to the Seal Colony. A short talk on the seal’s lifestyle patterns. Catching waves with kayaks on return trip. End of tour and opportunity to ask further questions. Please note that prices advertised are not for private / exclusive bookings.